At Clinical Trials Ontario (CTO), we work closely with the clinical trials community to capitalize on Ontario’s health sciences assets and deliver on our mandate to build a stronger and more efficient clinical trials environment while maintaining the highest ethical standards for patient safety. Together, we have made a tremendous impact. Industry investment, cost savings and economic growth. Better medicines for patients, cutting-edge innovation and a thriving health sciences sector. These are some of the ways that patients, industry, hospitals and research sites benefit from a strong clinical trials environment in Ontario. CTO Stream, our Ontario-built online system, enables all research sites participating in a clinical trial to undergo a single ethics review rather than separately applying to their local research ethics boards, reducing the time and labour required to obtain research ethics approval. CTO thanks the many volunteers from the clinical trials community who helped build CTO Stream. Building on our success with CTO Stream, new CTO programs are making it easier to initiate and conduct clinical trials in our Ontario. CTO’s Industry Concierge Service is making it easier for pharmaceutical and medical device companies to conduct trials in Ontario by connecting them with researchers, trial sites and resources in Ontario’s clinical trials ecosystem. We’ve connected more than 50 local and global companies and published a Resource Guide to Conducting Clinical Trials in Ontario. We’re also helping to open Ontario for business with new programs, including QuickSTART. QuickSTART will further accelerate trial start-up times by streamlining processes to enable trial activation within 90 days – months faster than the current standard. People are the heart of clinical trials. It’s through their courage and hope that medicine moves forward and new treatments are discovered. We’re putting in place tools and resources for patients, front-line health care professionals, health charities and the public to share information, insights and stories to ultimately shape and improve clinical trials in Ontario. Our Find a Trial portal and clinical trial decision tools are just some examples. Find more here. Pilot initiated for new QuickSTART program to accelerate trial start-up times and enable trial activation within 90 days. Launched Research Ready, a training and mentorship program for research coordinators, research personnel and new investigators in Ontario. Fifth annual CTO Conference draws nearly 500 participants. More than 100 hospitals and universities across Canada are participating in the Streamlined Research Ethics Review system. Industry Resource Guide published to support companies looking to conduct trials in Ontario. Development begins on Find a Clinical Trial web portal for patients and the public – the first of its kind in Canada. Fourth annual CTO Conference draws more than 450 participants. Streamlined Research Ethics Review System is expanded for observational research studies. Patient & Public Advisory Group is established to identify how patients can be effective partners in clinical trials. Industry Concierge Service is launched to help industry initiate trials in Ontario. #TalkClinicalTrials campaign established to build awareness about clinical trials. Third annual CTO Conference draws more than 400 participants. ENGAGE with patients and the public in Ontario’s clinical trials ecosystem to improve how clinical trials are done and help drive the delivery of new therapies and innovations. 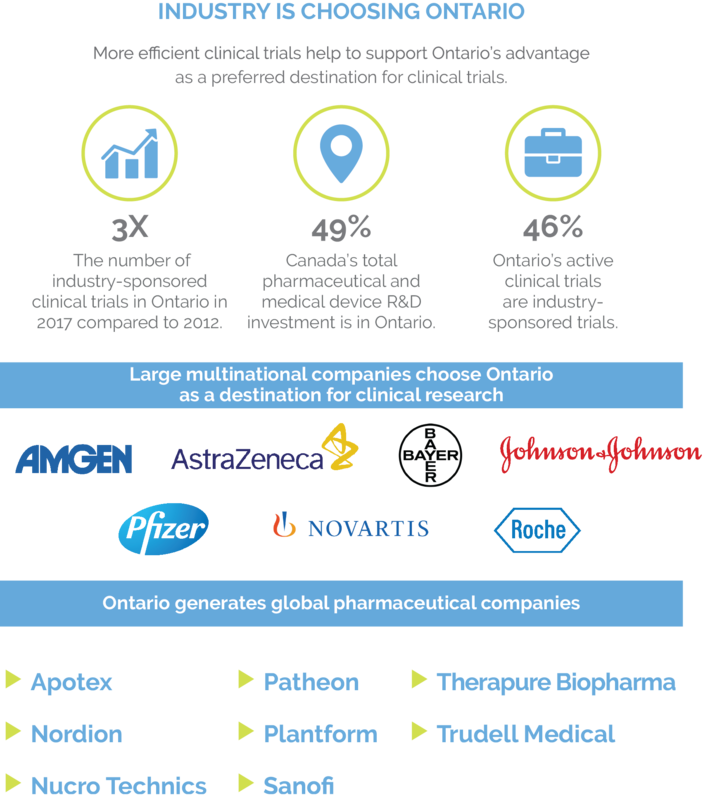 PROMOTE Ontario’s competitive advantages and clinical trial capacities to attract more industry investment. CTO Streamlined Research Ethics Review System (SRERS) is officially launched, establishing a single research ethics review for multi-site clinical trials in Ontario. Completed landscape review of trial participant recruitment and retention strategies. Completed public survey on perceptions and knowledge of clinical trials, in partnership with the British Columbia Clinical Research Infrastructure Network (BCCRIN). Second annual CTO Conference draws more than 400 participants. The CTO Streamlined Research Ethics Review System (SRERS) is developed in collaboration with Ontario’s clinical trials and research ethics communities. CTO REB Qualification Program is implemented, providing an independent review of Ontario REBs planning to participate in SRERS. Development begins on CTO Stream – a web-based platform to support SRERS. First annual CTO Conference draws more than 200 participants. Industry advisory group is established to provide CTO with access to vital expertise. Streamlined research ethics review identified as the top priority for CTO programming. Key components of the Streamlined Research Ethics Review System (SRERS) are identified: CTO REB Qualification Program, CTO College of Reviewers, and CTO Stream digital platform. Successful pilot of the CTO REB Qualification process in partnership with the Ontario Cancer Research Ethics Board (OCREB). CTO supports an Ontario response to the model Clinical Trials Agreement (mCTA). CTO is established with support from the Ontario Government. Working groups from a broad cross-section of stakeholders are established to advise on CTO programming. Stakeholder-led working group, convened by the Ontario Ministry of Research and Innovation, assesses the barriers to maintaining and increasing Ontario’s share of global clinical trials and recommends the formation of CTO.